Justice Robert Griffin was elected to the Michigan Supreme Court in 1986. He retired at the end of his term in 1994. Justice Griffin graduated from Central Michigan College (now University) and the University of Michigan Law School. He served in the U.S. Army during World War II and clerked for Michigan Supreme Court Justice John Dethmers before entering private practice in Traverse City. 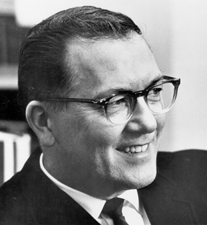 He was elected to the U.S. House of Representatives in 1956 and re-elected through 1966, when Gov. George Romney (R) appointed him to the U.S. Senate. He was elected to the Senate in 1966 and re-elected 1972.